I’m fairly certain most of us, especially those weather-weary souls from the Oregon Trail, know the beauty of bacon. Bacon is pretty great, yes. 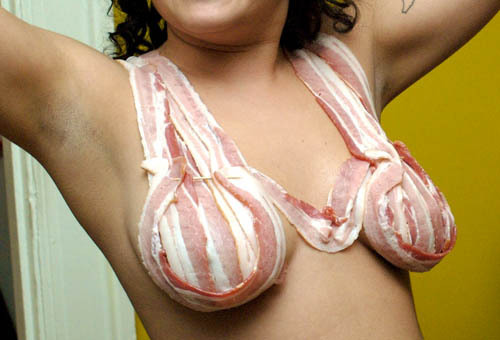 Bacon as an internet meme, an “I Can Haz Cheezburger” phenomenon, well, not so great. Actually pretty annoying. In the same vein as hipsters desiring praise for running errands, the bacon realization movement is just lazy, and subsequently, overdone. Bacon marmalade, bacon ice cream, chocolate-covered bacon, bacon cotton candy, bacon tattoos, bacontoday.com, bacon songs, ironic t-shirts with bacon on them, “I wonder if they can make bacon-flavored bacon,” bacon bras… STOP IT. STOP IT ALREADY. What the hell is next? A massive internerd following of salt? SALT IS SO GREAT. LET’S SALT EVERYTHING! HERE’S SOME SALT UNDERWEAR! I just feel for the little piggies. I’m sure there is someone out there, designing a Chick-Fil-A-esque “Eat Less Bacon” sign? This entry was posted on Thursday, March 25th, 2010 at 6:01 pm	and is filed under Meatball. You can follow any responses to this entry through the RSS 2.0 feed. Both comments and pings are currently closed.